Well, I did say in my homeschool post about 3 posts back, that we are starting something new this year. People have asked for me to go into detail.....so here you go! After 15 years of homeschooling, I needed a change. Actually, after I had Patrick I was sweetly convicted by the Holy Spirit as I sat nursing him one evening. I felt like the Lord impressed on me that he had given me a treasure that is actually an empty vessel. As parents we are responsible for their education and we are responsible for what we "fill them up" with. We have the awesome responsibility to fill them with the understanding, knowledge and wisdom of the Lord. Not the world's wisdom. And while I knew all of this as a homeschooling mom, I felt that many times I was just trying to "get by" with our schooling or do what was expected by the public school and just slide through. This is Foundations and is what I use for everyone, but it's primarily for K-6th grade. This above book last for 3 years, or cycles as they call them, and then you repeat. I can't believe all my kids have learned in just 4 weeks of school. This is a writing and grammar class for 4th-6th graders that I am doing with my 5th grader. It's intense...it's even challenging me! Oh, I'd love to know more about how this works in your home on a daily basis?!? I've heard of a few others that are doing it, but no one in our area. I don't even think they offer classes anywhere near us. Anyway, just curious about the details of how it works in your home! Thanks so much! Thanks for sharing this! 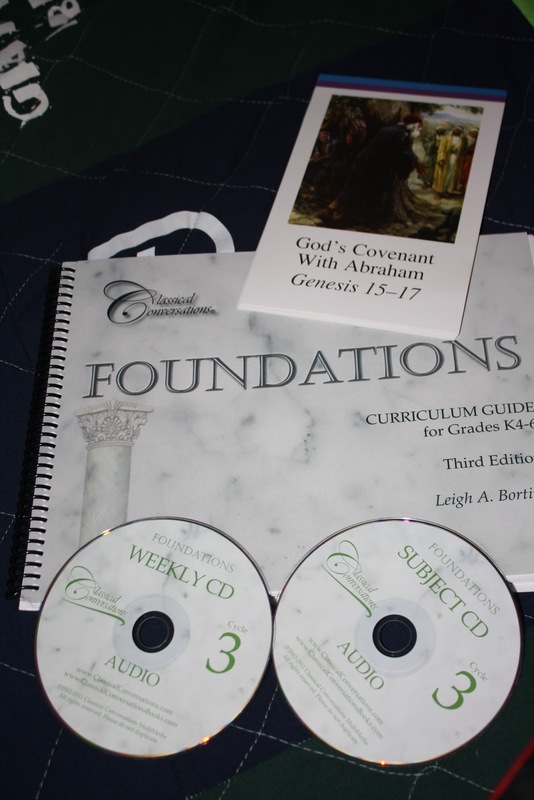 We are a few years away from formal schooling, but I am already weighing Christian school versus homeschooling (no one around here does that either!). I stubbled onto your blog through a "rabbit chase" and I am so glad I did. You have a lovely family. I know of several families who have used CC and really love it. I am eager to read more about how you are doing this in your home.